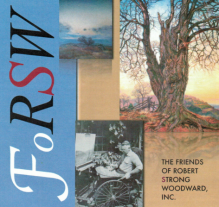 RSW- Artwork page, "In Early Autumn"
This painting was later "cut-down" (approx. 1950) after exhibiting for 10+ years. 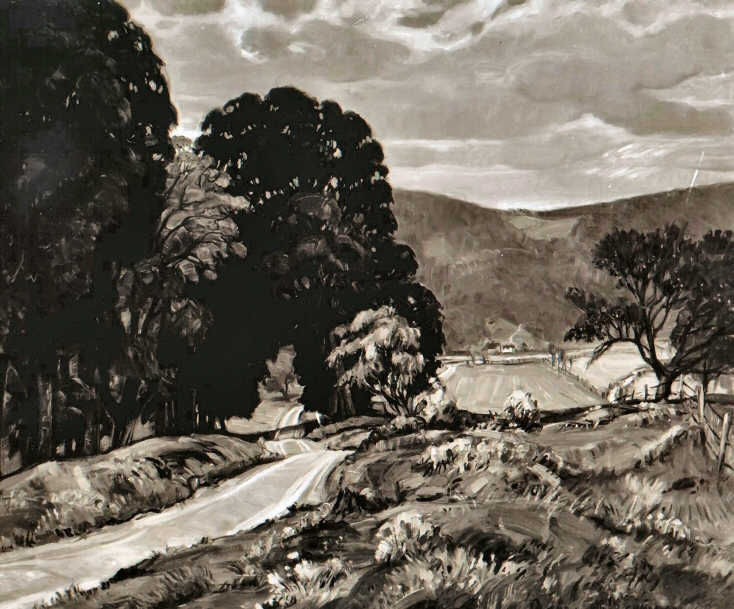 The painting was criticized for having two focal points (the road through the trees and the field to its right) which held an unbalanced composition. 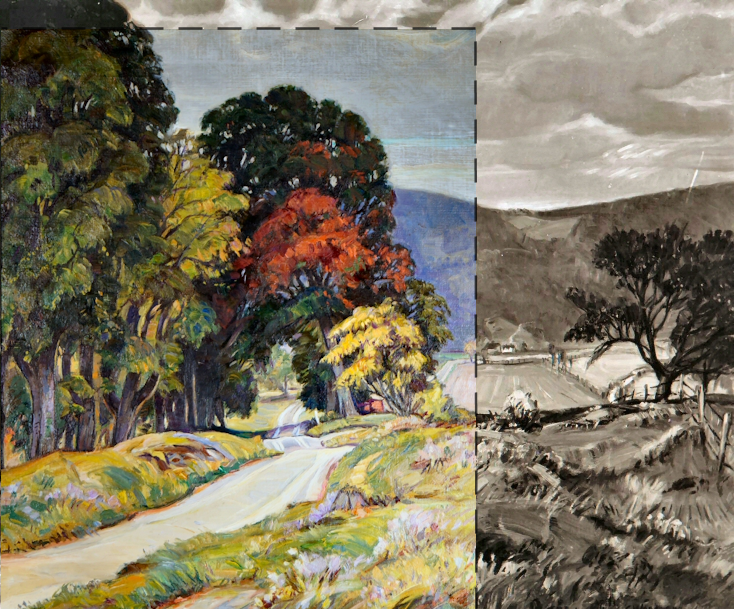 So RSW eliminated a large portion of right size of the canvas and renamed it Early Autumn..
"Painted in 1940 in the studio from the canvas Down an August Road. Composition similar with buildings left out and coloring changed from summer to that of early fall. 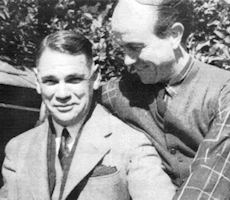 Made first for Gussie Borun (who owns the house at Halifax) of Beverly Hills, California, (through Harold Grieve) and sent out to California for Mrs. Borun to see, but she didn't care for it so it came back to me". In Early Autumn, Oil, has an unflattering history. After not being liked by its intended buyer, it returned from LA, unsold. 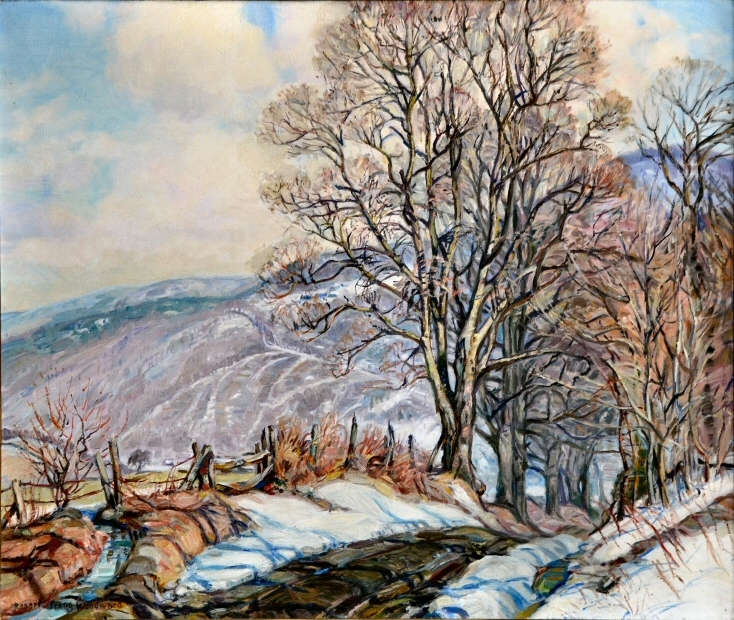 It probably stayed in the studio for a couple of years, then exhibited once in 1941, and again, sat idle in the studio for a couple of years before going to RSW's Boston agent, Vose Gallery and hanging for another four years. Sometime in 1949 - '50, the decision was made to cut the canvas down and renamed it Early Autumn. RSW did not re-sign the painting suggesting his displeasure of the whole experience. It sold quickly afterwards. 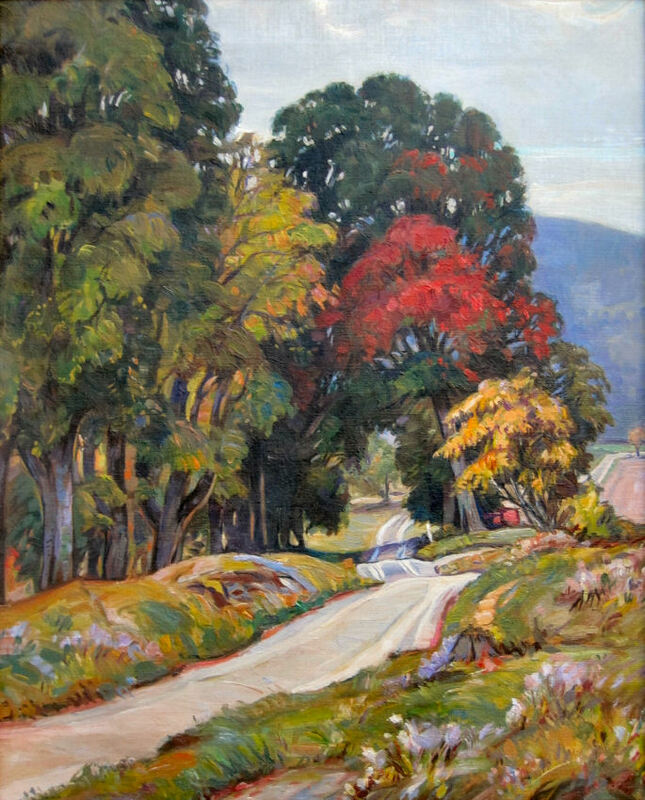 In 1939, the same year as In Early Autumn, Oil, is reportedly sent to Los Angeles a chalk drawing titled Early Autumn also appears exhibiting at the Williston Academy. 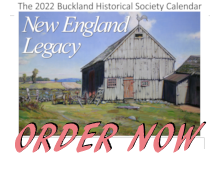 Given the information we have, we assume it is of a similar composition as one of the 5 other paintings and most likely, closest to this painting. What we DIDN'T realized until we matched up and laid Early Autumn over In Early Autumn that it appears that a portion of the sky was also cropped. This could be to fit a standard frame size of the time but was are just speculating in that regard.